As a family owned business for 30 years, Casual Cushion Corp. has been a leading US manufacturer of outdoor cushions and umbrellas. Our quality line of plush Hanamint cushions are a perfect compliment for your outdoor furniture. There are a variety of fabrics to choose from with many samples available in our showroom. Pricing varies depending on the grade of the fabric. We encourage you to come in and browse our collection in order to get a true feel for the fabric. 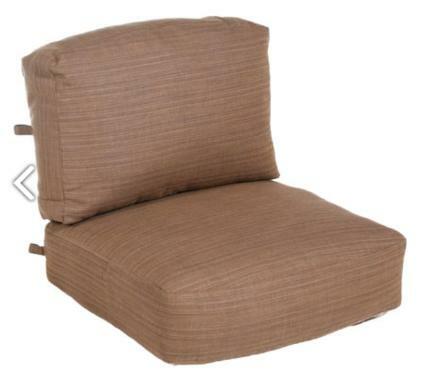 Item #7286 - Westfield Deep Seating Cushion. Boxed with zipper and cloth ties at the seat and back. Dimensions: (seat) 25" wide x 24" deep x 6" high; (back) 26" wide x 20" deep x 4" high. Stripes add 10% to the cost of the cushion. Order #7286ST for stripes. Fill: Foam core with polyester wrap.